Back in September I wrote an article examining the case that the Atos administered Work Capacity Assessment is psychological torture for disabled people, especially those suffering mental health conditions. One of the strongest pieces of supporting evidence was the fact that in May 2013 a panel of judges found that the assessment regime discriminates against people with mental health conditions. 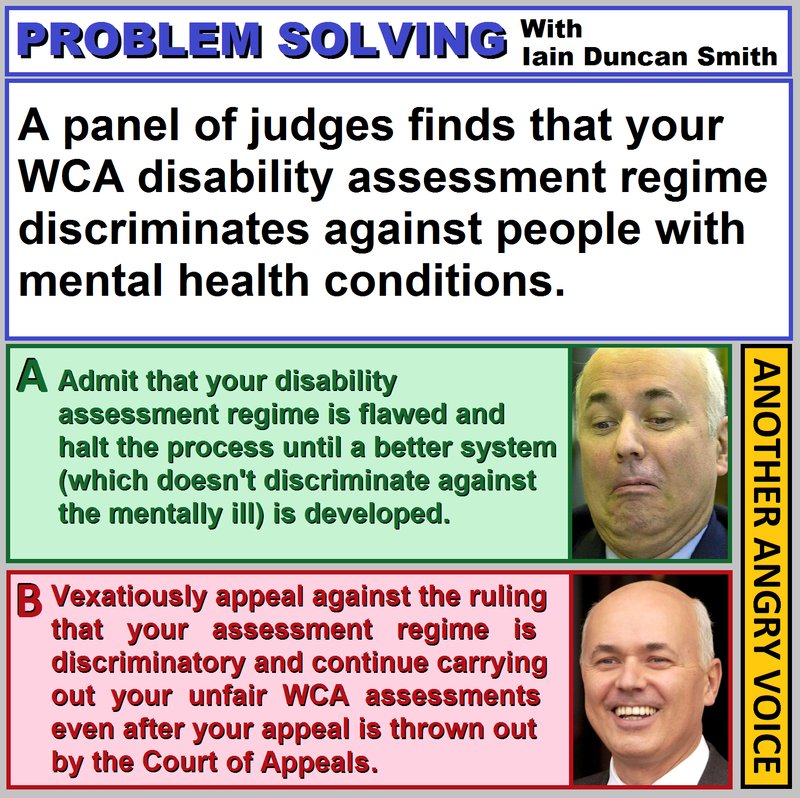 Showing his usual contempt for the justice system the Work and Pensions Secretary Iain Duncan Smith decided to carry on with his discriminatory disability assessment regime regardless, and to waste taxpayers money by submitting a vexatious appeal. In December 2013 the result of the appeal was announced. The DWP appeal was thrown out and the original findings that the WCA regime discriminates against people with learning difficulties, mental health problems and autismwas upheld. The essence of the case is that the vast majority of disabled people facing the WCA regime are expected to compile the medical evidence to support their case by themselves. It is absolutely clear that many people with severe mental problems are simply incapable of effectively gathering the required medical evidence, or in many cases, even understanding the requirement that they collect medical evidence to prove their condition. Despite the fact that they have now been found to be discriminating against people with mental health conditions by two different courts, Iain Duncan Smith and the DWP are absolutely determined to carry on with their discriminatory regime. An official DWP spokesperson claimed that the judgement would not trigger a pause in assessments and went on to claim that it will have “no effect on day-to-day business, which continues as usual“. In other words, they will continue discriminating against people with mental health conditions regardless of what the courts say. This entry was posted in Uncategorized and tagged dwp, Ian Duncan Smith, WCA. Bookmark the permalink.